A Lebanese friend recently revealed on a social networking website that he had bought a tie from Marks and Spencer. This otherwise insignificant revelation provoked a tirade of angry comments from Lebanese vigilantes that chided the irresponsible tie-wearer on his unpatriotic choice of neck wear. Even though I was aware of the M&S boycott policy as being one of the cornerstones of anti-Zionism among the Arab Diaspora, I was taken aback by the intensity of the reaction and people’s willingness to publicly chastise someone simply because of their fashion choices. This militant censoriousness is chiefly practiced by people who regard themselves as ‘secular’, and even liberal, making it much more problematic. It points to the disturbing emergence of a secular piety that is far more insidious than one stemming from a religious worldview. 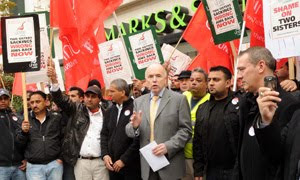 Before I left for Britain several years ago, I was instructed by several Lebanese friends on the necessity of boycotting M&S because of its ‘support for Israel’. Some assured me that all the profits that it made on Saturdays went directly to the IDF. The blunt way of phrasing the argument insisted that every pound spent in M&S translated into bullets fired at the Palestinians and the Lebanese, and no one would want to live with this burden on their conscience. But aside from the veracity of the claims, which I will come back to, this argument fails to comprehend the reasons for Israel’s military superiority. This superiority is not attained through private and public foreign aid but because Israel is an advanced industrial economy that is capable of developing advanced weapons through a combination of industrial and technological development. Of course the large difference in weapons production between Israel and Arab countries reflects the overall difference in levels of industrialisation and research and development capabilities between them. The notion that Israel’s military capability can be damaged through consumer boycotts in the West is misguided. Of course, most advocates of such boycotts are aware of this, that’s why boycotts are not intended as practical measures but as largely symbolic actions. A consumer boycott can be an easy and convenient way of appeasing one’s conscience and, but it is not a serious political act. But once such behaviour becomes imperative and social pressure is applied to monitor adherence to it, it becomes a form of grassroots authoritarianism that is fundamentally undemocratic in nature. The irony is that the same people who would normally oppose other forms of conformity in Arab societies would voluntarily act as social enforcers in the case of boycotts. Going back to the claim that all the Saturday takings at Marks & Spencer tills go to the IDF, there is certainly no record of it anywhere. However, activists insist on boycotting Marks & Spencer because it trades with Israel, although its historic position of supporting Israel has been altered in recent years. I am not interested in defending Marks & Spencer, but I find the idea of promoting the Palestinian cause through consumer boycotts in the West seriously flawed. Aside from all arguments on the effectiveness of such boycotts, pretending that complex political problems can be solved through altering consumer behaviour is a perverse notion. The most dangerous aspect of this is that it turns people from active political actors into passive consumers, both of products and of political/ethical choices that are distributed via ‘trusted sources’. Solidarity has of course played a vital role in the promotion of political causes historically; this is why it is important to understand how the expression of solidarity has altered in recent years in parallel with this shift from active political subjects to passive observers. The international volunteers that participated in the Spanish Civil War left their families and friends behind and fought alongside their republican comrades against the Fascists. This was a conscious and active political choice as opposed to the mundane consumerist choices that we are now told are legitimate expressions of solidarity. I am obviously not asking for people to volunteer in global conflicts today, but asking for a reassessment of what forms of solidarity are politically meaningful. Where you buy your underwear is not one of them. Taking the boycott argument to its logical conclusion reveals the arbitrariness of singling out specific companies. Should we boycott the Western countries that support Israel financially and militarily? Would anyone seriously propose not studying in the US or going on a holiday in the UK? Should we stop using American textbooks and boycott all German cars? If boycotts are not about the actual economic impacts but represent a moral imperative as some insist, then where do we draw the line of responsibility? Why is boycotting Marks & Spencer more morally pressing than the US? It seems to me that pro-boycott activists have taken their cue from another UK retailer: their message seems to be every little helps. Like it or not, global trade links are so wide and complex today that singling out companies to boycott is impractical. But more importantly, as long as Arab countries remain as net importers of industrial products, as well as technology and knowledge, such boycotts will definitely harm Arab societies more than the intended companies. The international economic sanctions on Iraq that followed its invasion of Kuwait were a stark example of the devastating effect of disengaging from the global economy. I witnessed firsthand the deterioration in Iraqi society during the 90s as a result of the sanctions. Within the space of a decade, one of the most advanced Arab societies was set back several decades. Boycotts are in fact a form of self-imposed economic sanctions. The advocates of boycotts are of course aware of this. They are not interested in implementing wide-ranging boycotts but in altering individual behaviour and maintaining conformity to a ‘shared’ idea. They insist on those meaningless symbolic gestures as a way of showing commitment to The Cause. But boycott vigilantism is only a symptom of widespread intellectual intolerance. By volunteering to behave like secular coercers, educated and politicised individuals are only contributing to this problem. No just cause will thrive on a climate of intellectual repression. And while we’re at it, let’s keep where we buy our underwear out of public discourse.